Honda Cars Philippines, Inc. (HCPI), finally announces the price of the all-new BR-V. Starting December this year, the entry price of this 7-seater SUV in the country will be P 989,000. This currently makes the All-New BR-V the most affordable 7-seater SUV in the Philippines (read our first impressions, here). Reasonably priced, the features of the All-New BR-V S CVT variant remain uncompromised. Its masculine exterior design is emphasized by fog lights, roof rails, and 16-inch alloy wheels. Inside, it is equipped with a high quality and technology-packed interior featuring a spacious and comfortable cabin, 7-inch Touch Screen Display Audio, digital air conditioning controls, and rear air conditioning system with independent controls. Meanwhile, the All-New BR-V V Navi CVT is further enhanced with advanced technology through Smart Entry with Push Start System, Built-in Navigation powered by Garmin, front automatic climate control, power folding mirrors, and paddle shifters. Its rugged and sporty exterior look is completed by a front and rear bumper garnish, chrome side sill garnish and door handle, and LED position lights. In addition, this top-of-the-line variant is equipped with leather seats. This feature-packed variant will be available for only P 1,119,000 (plus P 20,000 for White Orchid Pearl). Not only is the BR-V priced well, it also has the highest ground clearance among Honda’s SUV line up with 201 mm. It also carries top-notch safety features such as Vehicle Stability Assist (VSA) and Hill Start Assist (HSA), making it the perfect SUV for the Filipino family. Customers may catch the All-New BR-V from November 15 to 20, 2016 at SM City Cebu. Furthermore, customers may test drive the All-New BR-V for the first time at the Auto Focus Test Drive Festival at the SM Mall of Asia Grounds from November 17 to 20, 2016. The vehicle that makes you rise above your limits is almost within reach. Customers may reserve now and be one of the first to own the most affordable 7-seater SUV in the country. Delivery of the All-New BR-V begins this December. After holding the final price for weeks with their 30 minutes decision, it's still overpriced! The first time it was launch That only cost almost Php800thou before ...maybe this price is only in Japan. 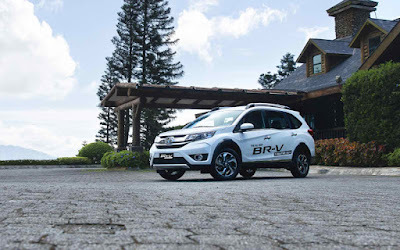 "This currently makes the All-New BR-V the most affordable 7-seater SUV in the Philippines"
Cheapest 7-seater alright, but still expensive pound for pound compared to say, Innova. A more detailed comparison/review is what we need not a press-release script. I have yet to see an article saying it is a Mobilio on stilts. Hehe. I hope they refresh the Brio with the BRV's dash board and instrument cluster. I'll test drive this at MOA next week before I complain. People who haven't tested it yet are deeming it overpriced, and comparing it to an Avanza we use as taxis. Oh, and the Avanza targets the Mobilio and Ertiga. Mga Pinoy nga naman. Makapag-reklamo lang. Kung bibili ng mobilio, mag brv nalang. Below is my comparo of the most salient points. MY VERDICT : The Overall Winner is Nissan Juke ! The Juke looks like a frog. It also has a bad transmission. Though fuel efficient, I would rather add around 100k and buy a compact(Honda Civic, Mazda 3, or a Focus) than the Juke. BR-V should be priced around 895K base model to 989K premium model, And makes the compitation more fun, Godbless! You insist the JUKE & ECOSPORT are not 7-seaters? Then buy the INNOVA 2.8 J. With its 163Hp x 343Nm engine output, it's performance is comparable to the old Fortuner, Montero, Everest & Alterra. Priced at Php1,021,000. Only 22k difference from the Base BRV. Juke - sold in Europe, South America, South Africa and Asia. Ecosport - sold same as the Juke. BrV - sold in Phils, India, Pakistan and Bangladesh. There is nothing in the Ecosport that will make it better than the Honda. Like the Juke it's too cramped. The DC transmission is horrible. Lastly just because this is an Asean car doesnt make it inferior. It even means it is more suitable to our roads. Holy crap! Autoactiv made sense! Minsan lang to! The ecosport looks nice but the seats are hard and not comfy, and quite sluggish. The transmission is also jerky. Sometimes people hate me. Sometimes people love me. Sometimes they like my comments. Maraming salamat po sa inyong pag-appreciate sa comment nyo. Kayo po ang nagbibigay inspirasyon sa akin para mag share ng idea. Mabuhay ang carguide. Mabuhay ang mga car owners. I-enjoy po natin mga cars natin anumang gawa ito. Sa mga wala pa pong car, enjoy po ninyo ang inyong mga kariton. Mabuhay po tayong lahat. Happy 'Pacquio Vargas' fight viewing ! Honda keeps marketing this as an SUV. It's just a crossover MPV, pretty much the Mobilio on stilts. Like how the HR-V is the Jazz on stilts, or the CR-V the Civic on stilts. Those are crossovers or CUVs. Not that it's bad, it's just confusing. Only thing that resembles an SUV on this are the fender flares, and roof rails. And the Juke is a better vehicle definitely. Let's just wait for the refreshed version which looks a lot more normal. For those curious, google is your friend. The Juke? lol. The transmission and the front face are horrible . Juke is pretty cute. Because of it's non conventional design it will age better than the traditional ones. Heck it's already a 5 year old car in other countries, Its quirky design looks better than traditional boring looking ones like the Mobilio, City etc. Also what's wrong with its transmission? Just because it's a CVT? Is this the way Honda do to attract potential buyers? Is there by any chance that this car will get a reverse camera? I own a Mobilio and honestly I think this is a Mobilio on stilts and Honda is overpricing it but I have yet to test deive it.